My shawl has been redeemed! I pulled the needles and frogged the first attempt. And so over the long weekend I forged ahead. I managed to complete the first four sections! There is an orange locking stitch marker to tell me the “right side”. But now that I have the contrast rows added it’s fairly obvious on its own. But I’m going to take all the help I can get! Truth time…I still think I have mistakes in here. My stitch counts were NEVER right at the end of a section. So I just fudged it and moved on. It’s garter…..no one will know. I’m just so over the moon with my color choices that I’m having a hard time putting it down! Okay so Jellybean and I cast on my shawl for Mother’s Day, remember? Well, I am working through the first section which is 14 repeats of a four row pattern. Simple right? 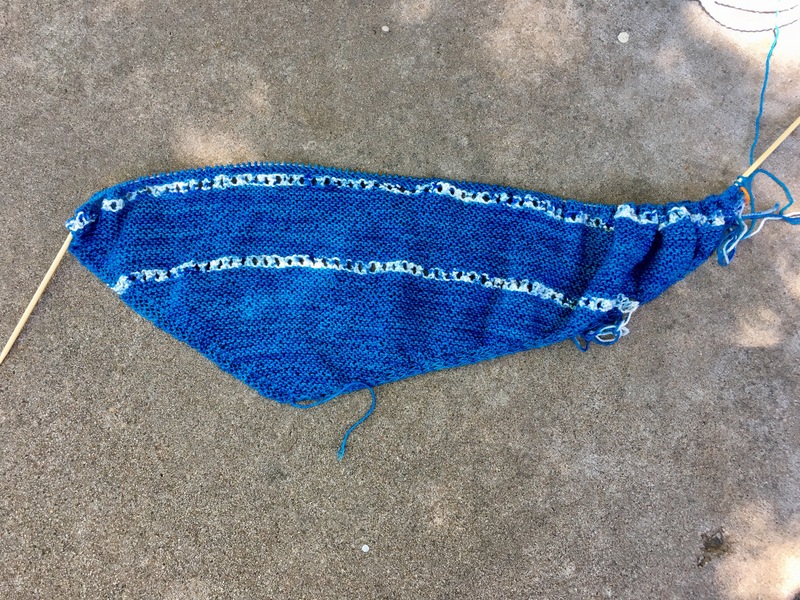 The shawl is asymmetrical and should be growing faster on one side than the other. 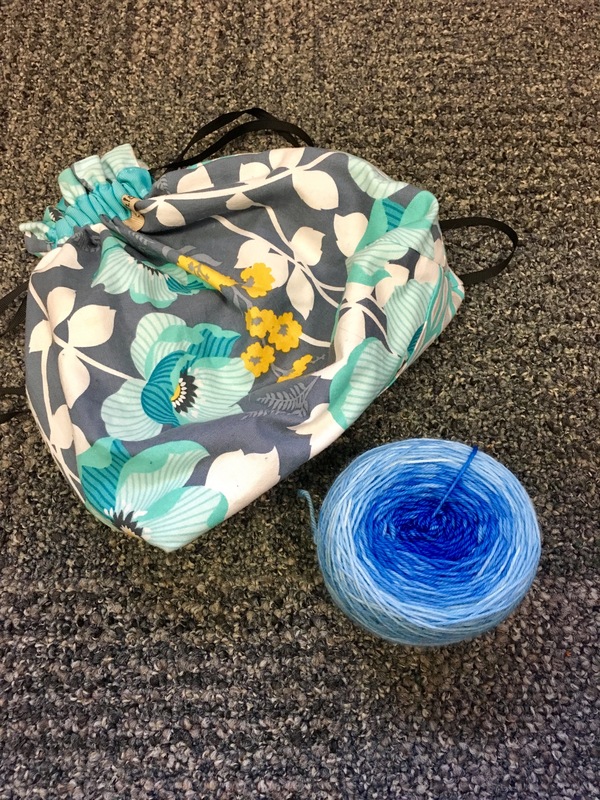 Well between some glasses of wine while Knitting and having to put this project down multiple times to deal with toddler bedtime meltdowns…..I’ve totally punted this. Like a lot. The only answer is to rip it back and start again. My Dad’s Christmas socks have a heel! 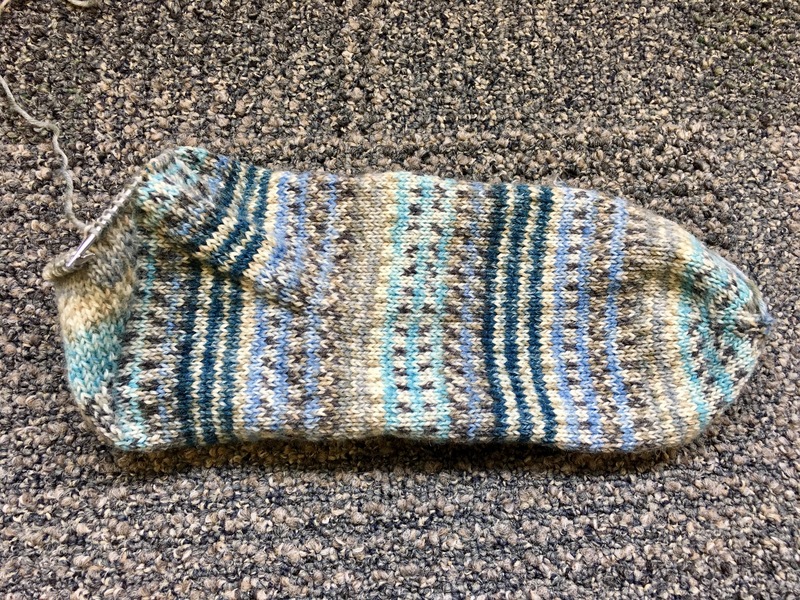 The gusset and heel turn are complete. I feel so accomplished after admiring the engineering of a heel turn. I always work toe up so that means my gusset heel doesn’t have any holes. So in my opinion it’s like magic! 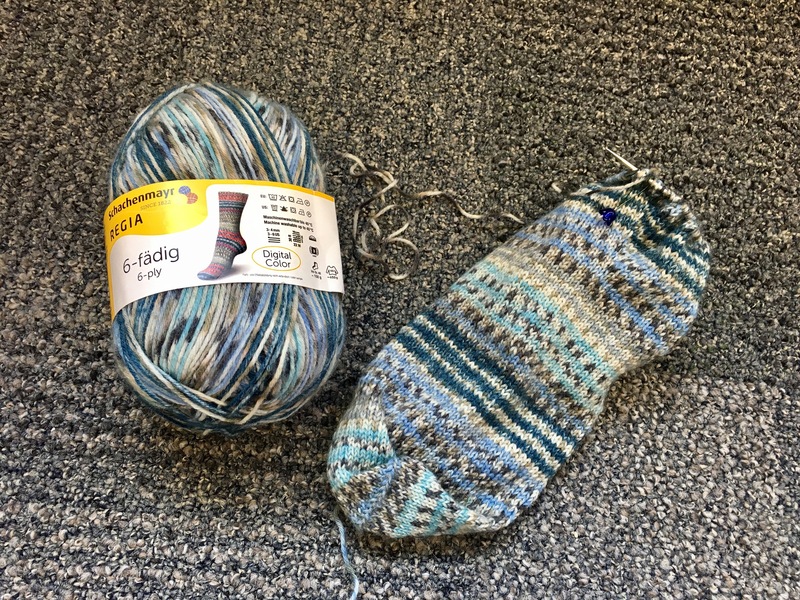 Have I told you lately how much I love sport weight socks and their speedy knitting?? I found myself with some recent car travel and no Vanilla Socks on the needles!! 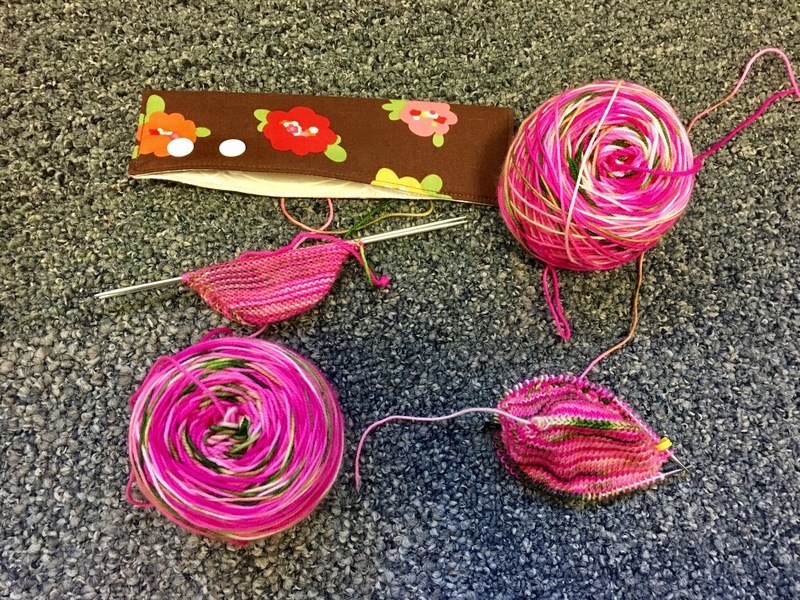 I couldn’t let that happen so I grabbed a ball of sock yarn and needles and hit the road! I grabbed some Regia 6-ply from my recent fall down the yarn hole. This is just a basic toe-up vanilla sock with 72 stitches and gusset heel on US 2s. It matches the carpet quite well don’t you think? I’m already at the heel and creating the gusset! This heavy yarn just knits up so fast! All this sock is from one car trip and a trip to the theater to see Guardians of The Galaxy. (Funny movie by the way.) It will be super nice to add another present to the Christmas pile! Mother’s Day came and went but I did manage to get my Mother’s Day cast on! 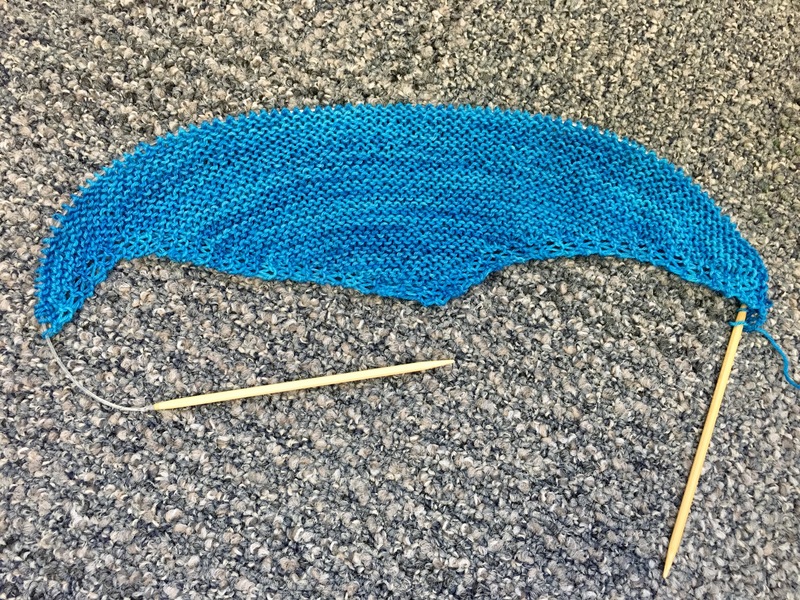 Nangou is now on the needles. 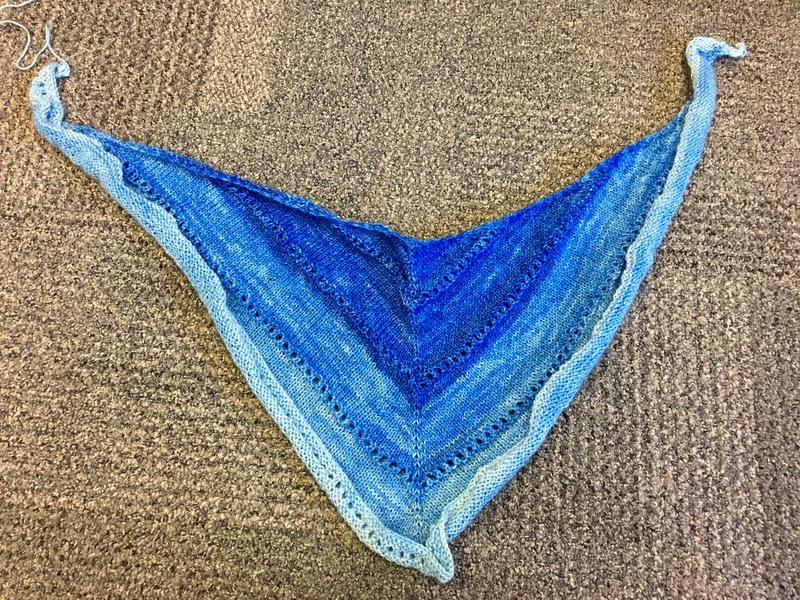 Holy moley…..I have a finished shawl! 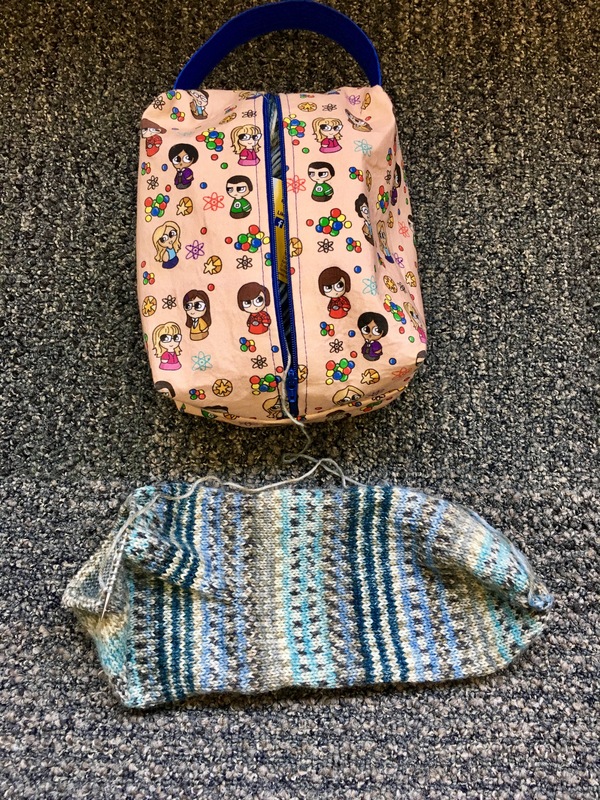 Four days later and I have a FO! This is my The Age of Brass and Steam in the gradient Rivulet set from Island Yarns. I literally just couldn’t put this down! It’s all curly in this photo but it’s actually drying/blocking as we speak! If I can’t talk my hubby into it I may have finished photos tmw…stay tuned…. 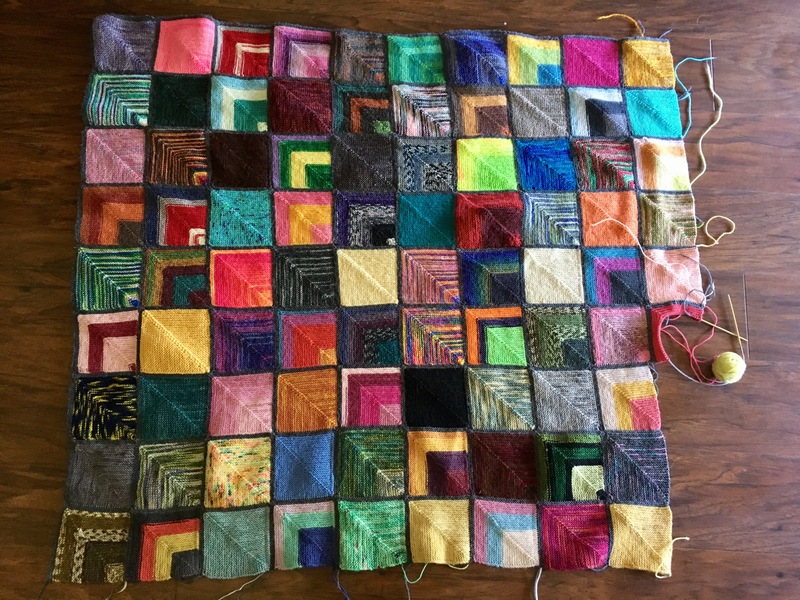 My Sock Scrap Blanket has new squares! Okay, only two and a third new squares. But this project just makes me so happy I can’t not share. Here’s hoping it brightens your Wednesday! After my recent trip into a yarn hole I came out with the most beautiful DK gradient set! Doesn’t the cake just look so awesome!! Guys…..I fell in a yarn hole. Sadly a yarn store in my region is closing! They were having a 30-60% close out sale and I took the bait. 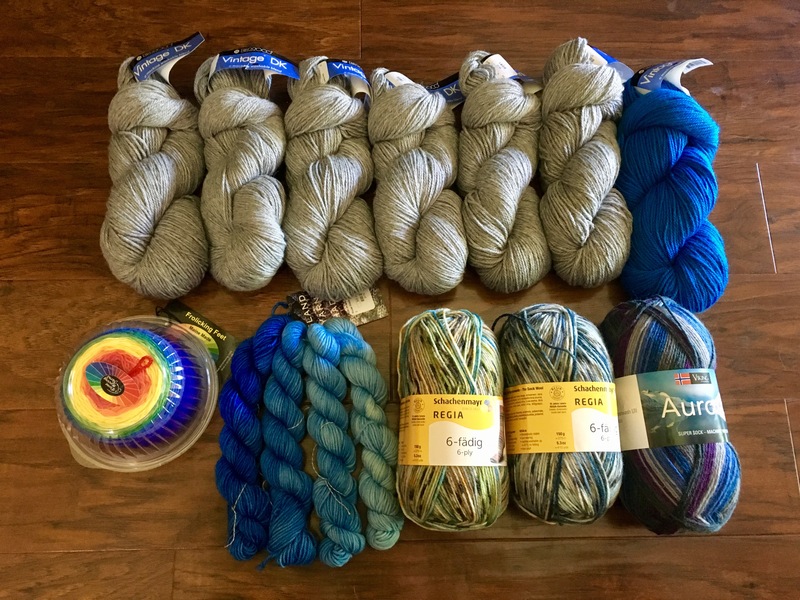 I didn’t NEED any of this yarn but I got a crazy good deal! I picked up a sweater quantity of Berroco DK for a garment for me. I picked up a main color of grey and a contrast color of royal blue. Then I got three 150 gram skeins of sport weight sock yarn to make socks for the men in my life. I then got two DK gradient skein/kit. The rainbow is from Dove Roving Company and the blue gradient set is Rivulet from Island Yarns. I know the Rivulet is going to grow up to specifically be an Age of Brass and Steam. All the rest went into my stash ☺️. I don’t know what they want to grow up to be! My Miss Babs yarn finally spoke to me! I found the Strands of Gold sock pattern by Linda Garland and thought the yarn floats would be awesome in this highly variagated yarn! It a simple toe up socks with short sections of holding the yarn in front and slipping the stitches behind it. So these are now called my “Strands of Drunken Watermelon” socks. 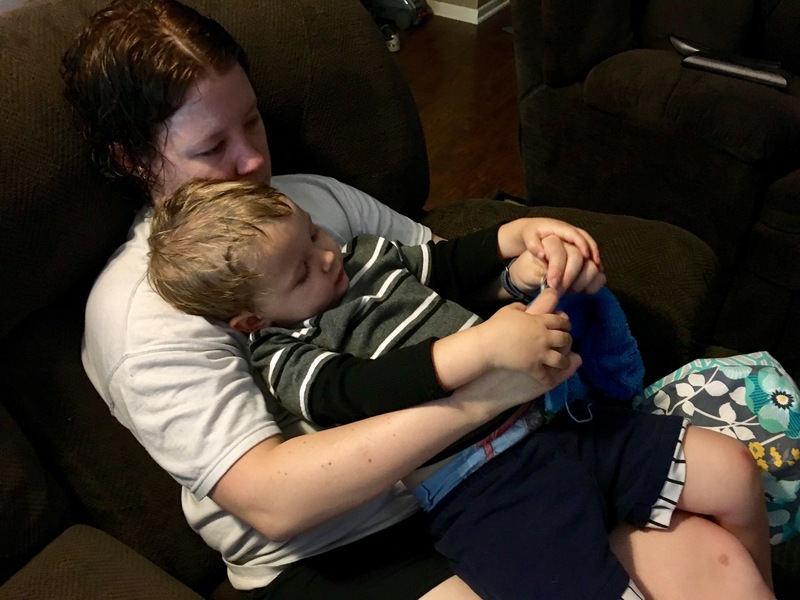 I set aside some time this week and cast on both toes. The first I put onto my 9 inch circ to work and the second is on DPNs inside the WIP minder that came with the bag. These are probably going to wait until after I finish my sister’s socks. here’s hoping that helps me fight SSS!